On Wednesday October 24th, AWR launched its 5th call for proposals, and presented the two new research projects that received grants this year. Antarctic Wildlife Research Fund (AWR) announced the winners of the call for proposals 2018. The selected projects are focusing on the role of fish in the Scotia Sea food web and on the estimation of krill biomass using new acoustic modeling. The fifth call for proposals is was launched during the meeting. For the 2019 edition, AWR is looking for research projects that will contribute to a better understand of krill biology and ecology, and the overlap of flying seabirds with krill fisheries. Closing date fro AWR’s 5th Call for proposals is April 19, 2019. 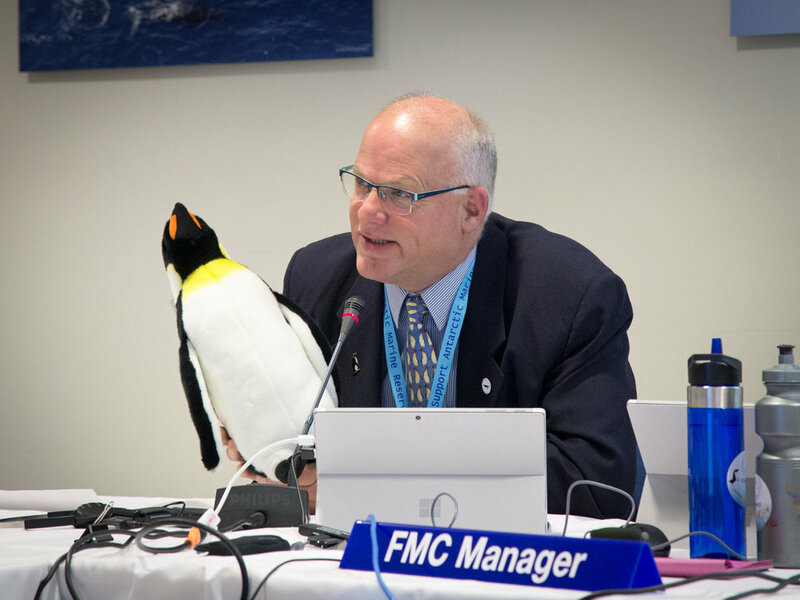 During the 2018 CCAMLR meetings, AWR expressed gratitude to Dr. Phil Trathan (UK) for his work as chair of the AWR Scientific Advisory Group and Dr. Polly Penhale (USA) as a member of this group. So Kawaguchi was announced new chair of the Science Advisory Group (SAG) replacing Phil Trathan. Mr. Kawaguchi is a Principal Research Scientist of the Australia Antarctic Division and leads the Australian krill research program. His research focuses on various aspects of Antarctic krill biology and ecology, including studies into climate change impacts on krill, with strong interests in krill fishery management in the Southern Ocean. So is the current Convener of the CCAMLR Working Group on Ecosystem Monitoring and Management. Dr. Rodolfo Werner together with Dr. Phil Trathna and Dr. Polly Penhale. Pictures from the meeting. Dr. Rodolfo Werner to the right, board member and Scientific Advisor to AWR. Claire Christian (34), Mark Epstein's successor, is Chair of The Antarctic Wildlife Research Fund and Acting Executive Director of ASOC - The Antarctic and Southern Ocean Coalition. What does The Antarctic Wildlife Research Fund (AWR) mean to you? AWR is an important initiative because it is supporting critical scientific work in one of the most rapidly changing areas on the planet. It also represents a joint effort of industry, environmental organizations, and scientists, and it is a very positive development that all of these groups can work together even though we have different perspectives. How is the AWR important for ASOC? ASOC believes that increasing scientific understanding of Antarctic ecosystems is vital to their continued protection, and we are pleased to be able to work with AWR to accomplish this important goal. ASOC also believes that Antarctica is the world's last great wilderness, and we are encouraged that there is a growing commitment from industry to help keep it that way. What do you find the most interesting about Antarctica? Antarctica is interesting because despite its harsh conditions, it still supports a diverse abundance of life. There are very few places left on earth where you can see the kind of aggregations of wildlife that we see in the Antarctic. And it is also interesting because it is so mysterious. Even with decades of scientific research, there's so much we don't know. It's probably not a common choice, but I'd say Labidiaster annulatus, an Antarctic starfish. These starfish are almost 2 feet across, with fifty arms, and they can catch live prey such as krill out of the water. Starfish aren't usually so intimidating! If you were world leader for a day, what changes would you implement? First I'd make the precautionary approach mandatory when making decisions that affect the environment. Too often we ask for proof that the environment is being harmed before limiting human activities, rather than requiring proof that it won't be harmed. We have experienced the negative consequences of that attitude for long enough. I find it absurd that we debate how much air pollution is acceptable when breathing is so fundamental for supporting life and so many children have respiratory problems, for example. We have to rethink our decisionmaking processes. I'd also mandate equal rights for women and allocate funding to send every child in the world to school. It's appalling to me that so many women around the world cannot exercise their basic human rights. And all children deserve an education. The world will never prosper unless we provide equal opportunities and justice for all and protect the planet. If time travel becomes a possibility, I would want to have dinner with Shirley Chisholm, the first black woman elected to the U.S. Congress in 1968. She was also the first black person to run for president, and in her campaign she used the slogan "Unbought and Unbossed", which is possibly the best campaign slogan of all time. I think of her as a practical idealist, someone who could get results, but who never compromised her values. Her enormous courage and determination are inspirational. What would you serve, and what would you talk about? I always like to find out if my dinner guests have any preferences, so it's tough to say without knowing what she likes. I do make an excellent crème brûlée, however! But in terms of conversation, I would want to hear her stories about being in Congress and running for office, and her insights on today's politics. And lots of practical advice on how to advocate effectively for the issues you care about. Shirley Chisholm's memoir is decades old but still has many insights that resonate today. Her advice would be very valuable. The field season in Antarctica is getting closer, which means the start of the three research projects funded by the Antarctic Wildlife Research Fund’s first-ever research grants. Do non-breeding Adélie, chinstrap, and gentoo penguins potentially use different habitats and feeding locations than those used by breeding penguins? That is something Dr. Andrew Lowther and his colleagues from Norwegian Polar Institute and British Antarctic Survey will explore during the summer at West Coronation Island, Signy Island and Powell Island. Lowther et al. aim to address the knowledge gap on adult, non-breeding, and therefore more mobile, birds in a region where most of the krill fishing in the Southern Ocean takes place. During the 2015-2016 field season they will collect at-sea foraging data on non-breeding adults at several different sites in the same year. These data will be collected with similar data on breeding adult penguins from each species, providing additional comparative studies on breeding and non-breeding penguins and the effects of interspecific competition between birds that are breeding versus those that are not breeding. This will contribute to a better overall understanding of the habitat and prey needs of penguins. Because of their enormous size, humpback whales have high energy demands that can only be met by foraging in areas where their prey are present in large numbers. As a result, humpback whales distribute themselves and move between areas of high prey abundance throughout the Antarctic feeding season. Dr. Ari Friedlander of Oregon State University and his colleague from Duke University will conduct a long-term ecological study on the foraging behavior of humpback whales around the Antarctic Peninsula. The goal is to determine how critical foraging areas relate to historic catches of krill in the region. By deploying satellite-linked time depth recording tags on whales throughout the Antarctic feeding season, the scientists aim to quantify if, when, where, and to what extent commercial fishing effort and humpback whale feeding co-occur. This information is important for managing fishing while also providing useful information on the biology and ecology of these top predators in a changing environment. Unlike fish, krill lack hard parts from which age and growth can be measured, and they are too small and numerous to be tagged. To fill this gap for krill, Dr. Raouf Kilada and his colleagues from the US National Marine Fisheries Service and Australian Antarctic Division will explore a new direct ageing methodology for Antarctic krill based that looks for annual growth bands in the krill’s small and fragile eyestalk. Kilada et al. will conduct studies to validate this technique, which is based on existing technology, by comparing the eyestalk of krill to other crustaceans like shrimps and crabs. An understanding of the variability in population structure (growth, recruitment, and size at maturity) is necessary to manage the krill fishery appropriately. If shown to be robust, this technique would open up the possibility of making direct comparisons of the size at age of krill in different areas and in different time periods, increasing our knowledge of key characteristics of krill populations. This beginning of these grant projects marks an important moment and the culmination of an enormous amount of effort by the AWR and the scientists involved. The Fund has also announced its second call for proposals which will allocate up to a total sum of USD $200,000 to fund Antarctic ecosystem research. AWR uses a multi-step process to ensure that the best proposals are chosen, based on scientific advice from the independent Science Advisory Group, comprised of the world’s leading Antarctic scientists. The Antarctic Wildlife Research Fund (AWR) announced its second call for proposals which will allocate up to a total sum of USD $200,000 to fund Antarctic ecosystem research. “I am very pleased and excited to see bold new partnerships such as AWR, where scientists, the private sector and nongovernmental organizations are stepping into the void of much needed new research and monitoring in the Southern Ocean. AWR reflects the very best of CCAMLR’s original conservation intent – putting money into understanding what is needed to ensure that human activity is in harmony with the wildlife throughout the Southern Ocean ecosystem” said Mark Epstein, Chair of the AWR board and Executive Director of ASOC (The Antarctic and Southern Ocean Coalition). Dr. Christian Reiss on the development of a new direct ageing methodology for Antarctic krill. Dr. Andrew Lowther on how brush tail penguins (Adelie, chinstrap and gentoo), key consumers of krill, rely on predictable aggregations of the small crustacean in order to successfully raise and fledge chicks during their austral-summer breeding seasons. Dr. Ari Friedlander on the long-term ecological study on the foraging behavior of humpback whales around the Antarctic Peninsula, focusing on how critical foraging areas relate to historic catches of krill in the region. The AWR call for proposals opens in March and closes in June 2016. The call is made for projects in the order of USD $25,000 to USD $100,000. AWR’s second Call for proposals will allocate up to a total sum of USD $200,000. Launched in February 2015, AWR is a first-of-its-kind partnership between industry, academia and non-government organizations (NGOs), to facilitate and promote research on the Antarctic ecosystem. AWR believes that only through better understanding of the role of Antarctic krill in the Southern Ocean will it be possible to comprehensively protect the animals that depend on it for survival and ensure precautionary management of the fishery. The Antarctic Wildlife Research Fund (AWR) is happy to announce that the three projects named as the Fund’s inaugural grant recipients will present their projects at CCAMLR-XXXIV in Hobart the last week of October. Photo taken by Dr. Friedlander, who will conduct a long-term ecological study on the foraging behavior of humpback whales around the Antarctic Peninsula. – We are very glad with the quality of the proposals. The selected projects will contribute substantially to our understanding of the Antarctic marine ecosystem, helping us to improve our knowledge on the interactions between krill and its predators. Only through better understanding of the role of Antarctic krill in the Southern Ocean can we comprehensively protect the animals that depend on it for survival and ensure precautionary management of the fishery, said Dr. Rodolfo Werner, Scientific Advisor to the AWR. Dr. Christian Reiss (US National Marine Fisheries Service), Dr. Raouf Kilada (University of New Brunswick) and Dr. So Kawaguchi (Australian Antarctic Division) will develop a new direct ageing methodology for Antarctic krill. Dr Andrew Lowther, Dr Christian Lydersen and Professor Kit Kovacs (Norwegian Polar Institute), Dr Phil Trathan and Dr Norman Ratcliffe (British Antarctic Survey) will explore how brush tail penguins (Adelie, chinstrap and gentoo), key consumers of krill, rely on predictable aggregations of the small crustacean in order to successfully raise and fledge chicks during their austral-summer breeding seasons. Dr. Ari Friedlander (Oregon State University) and David W. Johnston (Duke University) are conducting a long-term ecological study on the foraging behavior of humpback whales around the Antarctic Peninsula, focusing on how critical foraging areas relate to historic catches of krill in the region. AWR invites CCAMLR-XXXIV delegates and secretariat staff to a lunch seminar introducing the scientific research projects funded by AWR in its first call for proposals Wednesday 28 October in the CCAMLR meeting room. 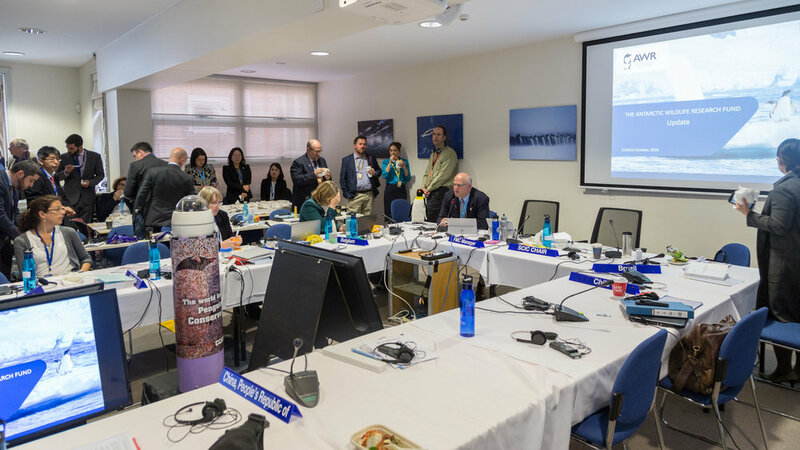 Mark Epstein, Chair of the AWR board and Executive Director of ASOC (The Antarctic and Southern Ocean Coalition), Dr. Werner, Dr Lowther, Dr Reiss and some of the AWR board members and scientists in AWR’s Science Advisory Group (SAG) will be present at the luncheon and introduction. The Antarctic Wildlife Research Fund (AWR) is pleased to announce the first three recipients of AWR’s first-ever research grants. Most Southern Ocean marine species, such as whales, seals and penguins are dependent on Antarctic krill—a small shrimp-like organism that forms the base of Antarctic food web. AWR’s mission is to fill critical gaps in research and monitoring to improve the management of the Antarctic krill fishery. A project to gather data and analyze the summer and winter foraging behavior patterns of humpback whales around the Antarctic Peninsula. Dr. Ari Friedlander (Oregon State University) will lead the project, along with his colleague from Duke University. A study on the foraging range and habitat preference of non-breeding brush tail penguins: Adelie, chinstrap and gentoo. The project will be led by Dr. Andrew Lowther, in cooperation with other scientists from the British Antarctic Survey and the Norwegian Polar Institute. “The ecology of non-breeding penguins is largely undocumented, and so this project has the potential to yield novel insights into how their behavior differs from that of breeding birds and what implications such differences may have for the management of Antarctic krill fisheries. 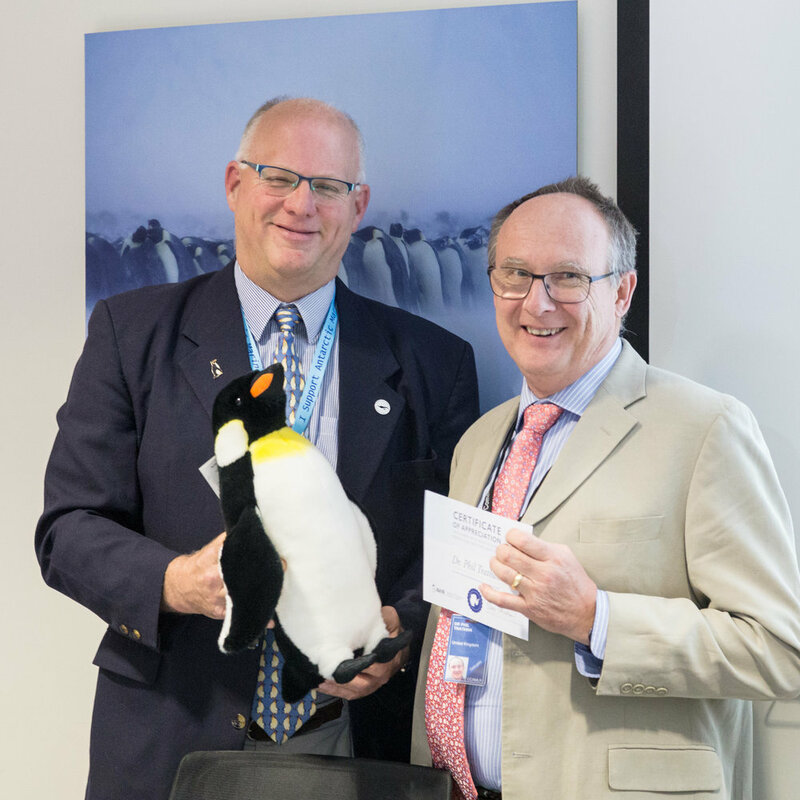 We are all very pleased that this project will proceed with AWR support and look forward to sharing its findings with the panel in due course”, said Dr. Norman Ratcliffe at the British Antarctic Survey. The AWR issued its first call for proposals on March 16, 2015, working with both commercial supporters and individuals to raise donations and inviting applications from scientific researchers whose research can aid in determining the impact of the krill fishing industry on the Antarctic marine ecosystem. Over the past three months, AWR’s Science Advisory Group (SAG) evaluated 10 scientific research proposals. The SAG based their evaluation of each proposal on criteria previously published on the AWR website, including: excellence, fit to scheme, cost effectiveness, and track record. Read more in the press release on the inaugural grants. The board of the AWR met for a board meeting in Oslo, Norway in August. One of the main points on the agenda for the board and scientific advisor Dr. Rodolfo Werner, was the decision on the proposals submitted by researchers from all over the world. AWR's Scientific Advisory Group already evaluated and prioritized the scientific research proposals submitted, based upon a number of criteria. The announcement of which proposal(s) that will get funding, will be published shortly. Scientific Advisor Dr. Rodolfo Werner, Board members Karoline Andaur, Sigve Nordrum, Andrea Kavanagh and Matts Johansen, Chair Mark Epstein and Secretary to the AWR Marte Haabeth Grindaker together at the pier Aker Brygge in Oslo a sunny day. Have a look at this short video presenting the Antarctic Wildlife Research Fund!